Sheku Kanneh-Mason wowed a global audience with his Royal Wedding performance - it was an extraordinary day for the teenage cellist when his sensational performance at the Royal Wedding stunned honoured guests at the ceremony and a billion more watching around the world. 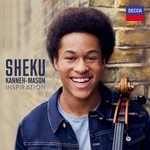 BBC Young Musician of the Year in 2016, Sheku pays tribute to his mentors and heroes on his thrilling debut album, Inspiration. 'Inspiration' reflects Sheku's own inspirations and influences, featuring a broad range of music from Bob Marley and Jacqueline du Pre to Shostakovich, including some of Sheku's own arrangements. The album includes Shostakovich Cello Concerto No.1, the concerto Sheku performed in the BBCYM final.